Thirty Six: Saint's Quarter — The Old Town Alchemy Co. This drink came about through an interesting convergence of events. The first was back in November 2008 when the Pegu Blog hosted a MxMo called "Made from scratch" for which I made a homemade cinnamon tincture and promptly failed to find a use for it. The second was more recent - a competition sponsored by Chairman's Reserve Rum to select contestants for the 2009 Rumfest where they would face off against bartenders from across the UK to win a trip to Saint Lucia. There's one key difference between this drink and the one I presented in the competition - I'm using Cognac as the base spirit, though not out of bitterness that I didn't win the comp. Part of the reason I started this madcap scheme of posting a new recipe every week through the year was to broaden mysyruo horizons and being honest, I'm pretty familiar with rum. Cognac is a spirit that I've grown to appreciate over the course of the project, and it's not the only category I've neglected. If the drink hadn't worked, or hadn't worked as well, with Cognac, I'd have just posted the rum version. As it happens, the brandy works out just fine. The recipe is designed to fire the four relevant senses - the rich colour from the Courvoisier and vermouth, the texture from the egg white, the refreshing citrus notes contrasted against the smoother flavours of the brandy and the chocolate bitters, and finally, the aroma of cinnamon as you go to drink. I couldn't find a way to trigger the sense of hearing - maybe get a smooth Frenchman to talk you through it, ma cherie? Shake the first six ingredients with ice and fine-strain into a chilled flute. Using an atomizer, spray the cinnamon tincture over the top of the drink as the garnish. 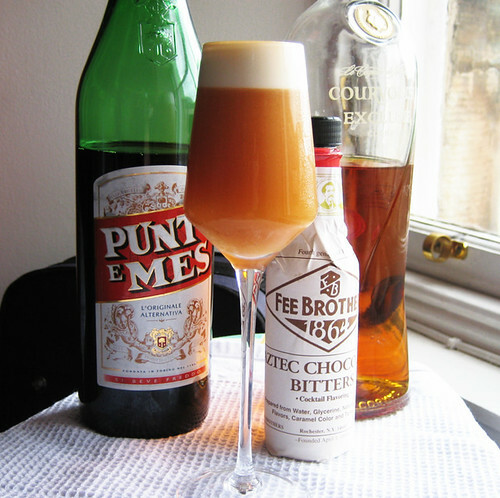 Posted on September 5, 2009 by Jon and filed under Fiftytwo, Mixology, Projects, Recipes, Uncategorized and tagged Aztec Chocolate Bitters cinnamon tincture cocktails Cognac Courvoisier Fee Brothers Punt E Mes vermouth.